On finally gettting a movie out of her head and onto the screen after comparing her romantic life to too many romcoms. For the longest time, Ann Lupo had just assumed that just about everybody envisioned their lives playing out like a movie, full of song-and-dance numbers and big orchestral swoons when two people who didn’t know they liked each other finally kissed. In fact, Lupo’s first feature may feel contrary to that moniker at first, prone to flights of fancy where the writer/director/star envisions herself as part of a roaring ‘20s Vaudeville act or hosting a ‘70s era game show as it relates to a tortured dating life, but things get real quickly with John (Miles G. Jackson), a guy she meets who isn’t ready for a committed relationship yet nonetheless blurs the lines between being friends and a romantic couple. It’s only appropriate then that Lupo, playing a version of herself, constantly fills in the communication gap with John in her head with ideas about what their relationship should be, ultimately setting herself up for the crushing moment when reality and fantasy can no longer co-exist, realizing that her imagination can only take her so far when two people are involved. However, in making a film drawn from real-life experience, Lupo’s imagination finds a proper home on the big screen. 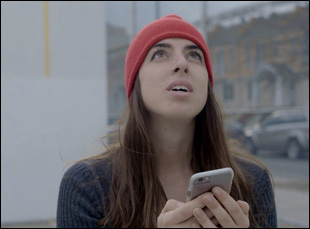 Using the visual grammar and rhythms of other cinematic romances to suggest what could be, a confessional interview is interspersed to convey what is and Lupo fearlessly thrusts herself into both arenas, carrying full-scale musical sequences with great gusto while stripping down emotionally to take a hard look at why her relationships have never worked out. Shortly before the film’s premiere at the Los Angeles Film Festival, she was equally candid about embarking on her first feature, reenacting traumatic moments from her real-life experience and finding collaborators she could trust with such a personal project. I really lived through the events of the film and then I came to a point where I just decided, wow, this has been going on for too long and I need to expand this for myself a little bit. 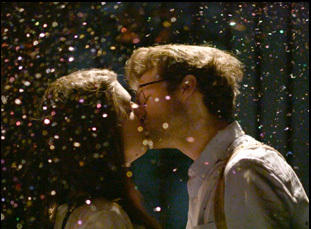 I had been listening to a lot of “This American Life” at the time and there was this amazing short film by Bianca Giaever that they released on Valentine’s Day about a couple that had been together for eight years, but they hadn’t said “I love you to each other” yet. That was one of the main crystals of sending me off into this journey because I saw how they recreated these scenes in this person’s life and it was all first-person interview, and that inspired me to think, “Oh, maybe I can just tell my story to myself.” I’m an editor by trade, so I started tinkering around with this little project on the side where I would tell the story of what happened as far as I understood it and then I would use that interview to create this collage short film and through doing that, I hoped that I would understand love completely [laughs] – and just learn to be more aware in my next relationship. I was just doing that short film project by myself, but it just started to grow and I had recently reconnected with Esteban [Pedraza] and Aaron [Pryka, classmates of mine from NYU, after graduation and I was telling Esteban about this idea that I had for this investigative, weird kind of pseudo-documentary thing and he’s like, “Wow, that sounds awesome,” so he came onboard and very quickly I entrusted him with the co-director title because I knew that if I was going to act, I’m not a trained actor. I have acted all my life, but it’s not my main forte, so I just knew I needed someone behind the camera who’s always making sure that I was giving the best performance that I could give and [with] writing, that’s where Aaron really came into play and they were both really amazing writing partners because they know me very well, my sense of style and my sense of humor, so I was able to just convey to them really what I wanted to say in the story. Then it became a longer short film that was more elaborate that had these narrative scenes and then it became a six-part digital miniseries that we were going to put up online. That was two years into the process and it was a total of 60 minutes of story, but then we very fatefully were connected with Super Deluxe, and [VP of Originals] Winnie Kemp encouraged me to add 30 minutes to it and make it into a full feature. I read that Esteban and Aaron interviewed you for four hours, which I imagine is what serves as the base for the film. What was that experience like? Yeah, the four-hour interview was like mining my soul a little bit. It wasn’t really about the movie. Basically, I gave Esteban and Aaron an outline of the movie that I wanted to make and they [already] knew the whole story about the John character, but I just gave them some guidelines of where I wanted to go with this and then they wrote the questions and asked me about lots of different things, [including] a lot of things that I wasn’t expecting, which was important. One of the things that was really upsetting in that moment of the interview was something along the lines of how does it feel to realize that you’ve been disrespecting yourself. The way that it was phrased was odd, but what they were trying to say] was, “Have you realized yet that you’ve been letting someone not treat you the way that you deserve to be treated? It was really not something that I had ever thought about until they asked me, so I had a long time working on the movie to unpack that, like I’ve not been valuing myself in the way that I need to in order to live a really fulfilled life and be in a fulfilled relationship. [Esteban and Aaron] were really able to help me [because] you’re not able to really see it from the outside, so they were able to show me a mirror of what I was trying to say and help me translate it into a cinematic way that everyone could understand. It was very important for me to have people that I really trusted because like I went through some stuff making this movie and it’s so important that they were like my friends first and foremost. My director of photography Nadine Martinez was also someone that I knew from NYU and my producer Holly Meehl is actually someone that I knew from childhood and had not seen since preschool, but then I ran into her at an IFP event around the same time I was starting this movie and she had just left her job and was starting her own production company and she took me in as basically her second big project, so we have been a very tight team this whole time and they were really dedicated to the whole thing. In terms of perspective, one of the moments in the film I really love is when your character cedes the screen to your boss Adrienne, who talks about her relationship. Those moments are rare, but crucial and I wonder what it might’ve been like to add perspectives in the film that weren’t your own? Yeah, the Adrienne character is based on a real story of my real bosses who I was working for at the time I was in love with this guy and that scene really took place. I was really bummed one day and [my boss] was like, “What’s going on, Ann?” Then she told me the story of their relationship, which is nearly exactly what is in her voiceover [in the film] and it gave me hope. obviously, It sent me back into my wanting this relationship to work out, so later when I started to write this as a short film, I always wanted to have different perspectives in it and I interviewed the real woman, Adrianna and I got her to tell the story in her own way and in her own voice and I used that to create that story. When I had this task of adding 30 more minutes to it to really fill out the story, that’s when I added the storyline of the best friend character, Lolly, played by KImiko Glenn because I felt like that was what was missing – how an obsession or how a mental lapse can affect your other relationships outside of the one you’re consumed by and how at the end of the day, your friends are there to tell you when you’re crazy, but also to be there for you. And [in general] I always wanted it to have other perspectives, but as we developed the original idea, most of those fell away and it became more about my central character, so I loved the fact that it goes into someone else’s world because I feel by that time maybe you’re sick of me. Maybe you need a little break. [laughs] But [that Adrienne scene specifically] is a really important moment for me because everyone has a story. They’re all different and it’s all totally subjective to that person’s experience, but when you’re looking for love and you’re really a hopeless romantic like I am, you’re looking for all the little similarities in other people’s stories and I wanted to show that. What was it like to recreate these scenes from your life? It’s very surreal and it’s really hard to sum up because so much happened in the process of recreating it that it’s almost hard to disconnect the feelings of the actual experience of when I really lived through it from the experience of recreating it. Then I had the added pressure of running a film production and managing a team of people and on top of it, I was going through a lot of emotional catharsis through making the movie, so at times, extremely, extremely liberating and exciting, especially when we were doing the fantasy scenes, other times when it was extremely painful and really hard to feel my way through a scene. And the film evolved from what I originally set forth because we shot the first black and white interview in June of 2015 and that first phase of production helped us gain some traction and show a proof of concept of what this short film is going to be [which] helped us raise money for our Kickstarter campaign almost a year that funded the more fantastical scenes of the movie, like the musical number and the game show. Then a year later, Super Deluxe came onboard, so it had three main phases of production and that was cool because it allowed me to grow as I was making it and become more in tune and aware of how I wanted this story to be told [with perspective]. You’ve got two co-editors, but what was it like to be facing with cutting your own “performance” in the film? Again, it was still the close-knit family and honestly, I got over it really quickly because I was like I have to be professional here and I can’t be like squirming at every take, so after the first wave of production, I really stopped critiquing myself in that way. And then it’s cool because I got to pick the absolute best takes. [laughs] I’m definitely an editor first and foremost, so that was definitely informing the way that I shot it and sometimes we would go for coverage and I’m like, “No, no, no, we don’t need that. I know how that’s going to be” – and then I would regret not getting the coverage later. [laughs] But we found really cool things in some of the performances [in the edit] that I hadn’t anticipated or expected, so that’s when we would play around with different options. What’s it been like putting out into the world? I’ve been so happy. We premiered at Woods Hole Film Festival last month and then immediately after that, my friend who [plays] the farmer in the beginning [of the movie], [really] has a farm and puts on local community events, so we did and everyone really loved it at both screenings. People came up to me and had so many positive things to say and it’s really cool that every time I watch it with a new audience, I see something I never saw before, which is cool because I’ve seen the movie thousands of times now. I’m just really excited to share it because it feels like people need to feel not alone in their romantic lives and this seems to strike a chord with people. “In Reality” will play at the L.A. Film Festival on September 22nd at 8:45 pm at the Arclight Culver City. L.A. Film Fest '18 Interview: Amy Goldstein on A Rock 'N' Roll Survival Story in "Kate Nash: Underestimate the Girl"